The tiara originated with -- you guessed it -- Queen Mary. She bought a parure of jewels set with diamonds and Persian turquoises, including this tiara, a necklace, a brooch, and earrings, from Garrard. She was never photographed in the tiara, probably because she had her own turquoise parure that also included a substantial tiara. The design of this piece is slightly different than that of the Teck tiara. You’ll sometimes see the Persian tiara called the "Triumph of Love" tiara because of the various symbols incorporated in its design, including laurel wreaths and lovers' knots. In 1923, George V gave the parure to his new daughter-in-law, Lady Elizabeth Bowes-Lyon. 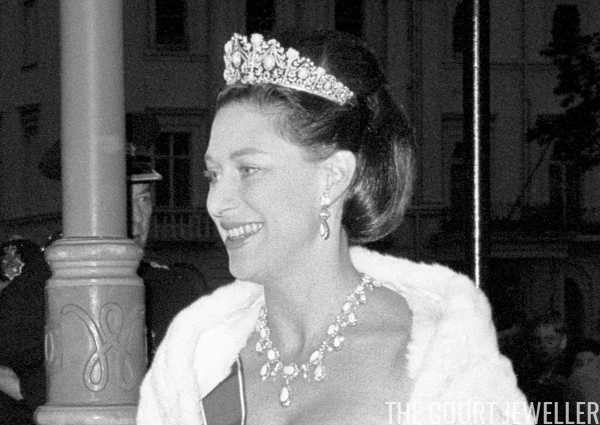 The tiara was originally a kokoshnik, but Elizabeth had it altered by removing the top row of diamonds. (In this original form, it reminds me quite a bit of the Milford Haven kokoshnik tiara.) She was photographed in the tiara, but it was never one of her most-worn sparklers. In 1951, Elizabeth (who was now queen consort) gave the entire parure to her younger daughter, Princess Margaret, as a twenty-first birthday present. After the Poltimore, the Persian tiara was the largest piece in Margaret's collection, and she wore it frequently at white-tie events with pieces from the coordinating parure. Above, she wears the tiara at the 1967 royal premiere of Taming the Shrew. Note: This is an updated and expanded version of an earlier post, with new text/images.